What Should You Use for Each Step of Your hPSC Workflow? Which medium should you use for reprogramming blood cells? For fibroblasts? Which medium should you use for culturing human pluripotent stem cells (hPSCs)? How are each of the passaging reagents different from one another? Should you plate hPSCs on Corning® Matrigel® or Vitronectin XF™? What should you think about when choosing a cryopreservation medium? There are many things to consider when choosing reagents for each step of your workflow. Use our infographics to help you decide! 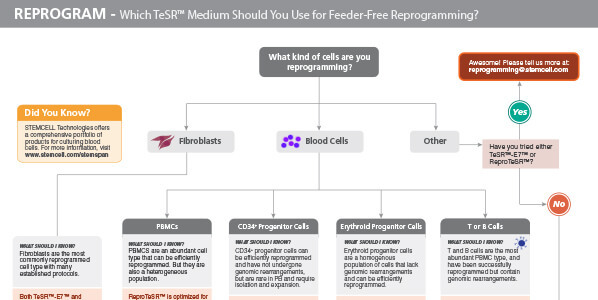 Which TeSR™ medium should you use for feeder-free reprogramming? Induced pluripotent stem (iPS) cells are derived from somatic cells through artificial expression of key transcription factors under specific culture conditions. Variables that affect reprogramming include the delivery method, culture conditions, and starting cell type. Use this infographic to choose the medium that is best suited for your research for efficient reprogramming. Which passaging reagent should you choose? From enzyme preparation to enzyme-free reagents, generating single cells to selectively detaching undifferentiated cells, multiple options are available that eliminate the hassle and variability associated with manual selection and scraping during hPSC passaging. 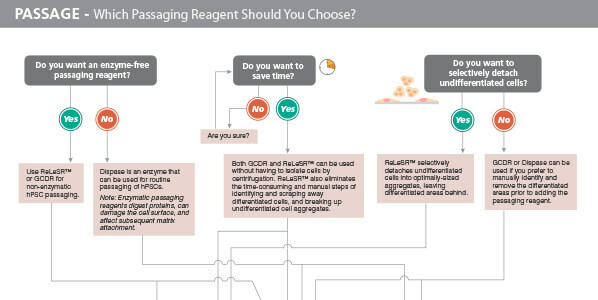 Use this infographic to help you decide the optimal reagents for your cell culture passaging needs. 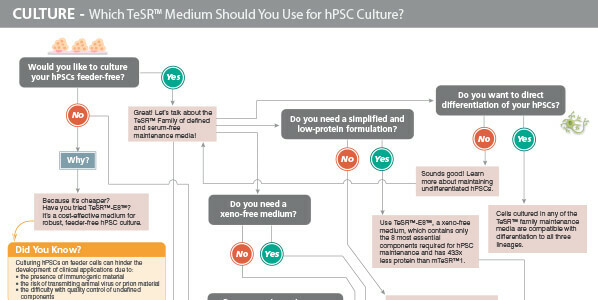 Which TeSR™ medium should you use for hPSC culture? Maintenance of high quality human embryonic stem (ES) and induced pluripotent stem (iPS) cells is critical to success in all applications of PSC research. Specific culture conditions are required in order to maintain undifferentiated ES and iPS cells that are capable of self-renewal. Use this infographic to choose the culture medium best suited for your needs. 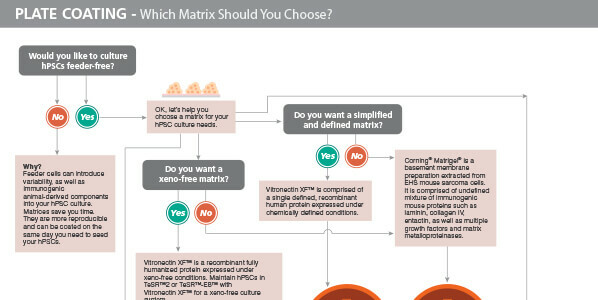 Which matrix should you choose for hPSC culture? From defined and xeno-free to more complex matrices, a selection of matrices are available that reduces preparation time and variation in your research. Use this infographic to help you decide the best matrix for your needs. 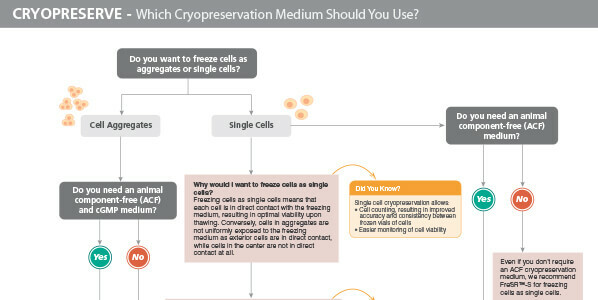 Which cryopreservation medium should you use? From animal-component-free media to those for freezing as cell aggregates or single cells, the available formulations are designed to maintain high viability and maximize cell culture recovery after thawing. Use this infographic to help you choose the optimal formulation for your research needs. Looking for more information on the most complete and defined system for hPSC culture and research? From generation of iPS cells to maintenance, differentiation, characterization, and cryopreservation of ES and iPS cells, learn how you can Maximize Your Pluripotential.